Many popular dishes are inspired by the tastes and traditions of the different nations that have ruled Croatia throughout history. 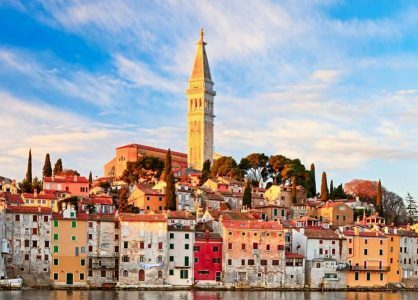 The classic cuisines of Italy, Austria, Hungary and Turkey have all influenced what has now become authentic Croatian cooking. Many dishes are also specific to certain regions. 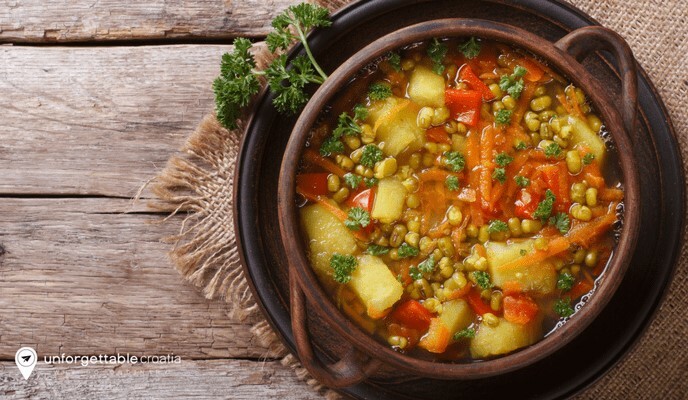 One of the most popular dishes on the menu in Istrian restaurants is manestra – a bean soup. The soup is slow cooked for hours, and includes a pesto made from pancetta, garlic, and parsley, and pieces of cured meat. There are many variations, including manestra od bobići (bean soup with corn), and jota (bean soup with sauerkraut). Baking meat, seafood and vegetables under a bell-like lid that is covered in embers is a popular cooking method used in Croatia and neighbouring Bosnia and Montenegro. When making Hobotnica ispod peke the seasoned ingredients are placed in the lidded dish, before placing in the fireplace. It is covered with embers and cooked for hours. Honey, cognac and Mediterranean herbs can all be added half way through the cooking process. 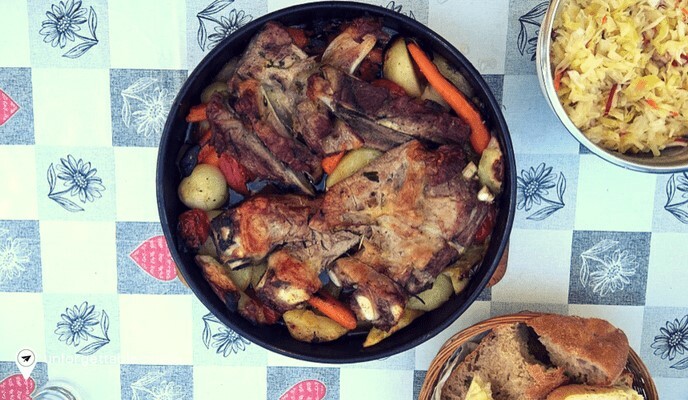 Read our recipe for traditional Croatian peka here. Istarski fuzi is a homemade pasta dish that is typically Istrian. The hand-rolled pasta is cut into diamond shapes and rolled with a chopstick so opposite corners touch and form a hollow tube. Fuzi pasta is usually served with different types of stews; mushroom, truffle, chicken, or beef stew are the most popular options. Soparnik is a traditional Dalmatian savoury pie filled with Swiss chard. It’s Croatia’s answer to pizza but differs in that there is dough on the top and the bottom. There is an annual Soparnik festival held in Dugi Rat (down the coast from Split), every July, to honour the delicious pie. Local families compete for the title of ‘best Soparnik’. Punjene paprike is a dish of bell peppers stuffed with minced meat, rice, and spices, and cooked with tomato sauce. It’s especially popular in the summer. Sarma are stuffed cabbage rolls and are a winter alternative to Punjene paprika. Pork and veal mince are mixed with delicious spices, rice and herbs and rolled into cabbage leaves and cooked in a tomato sauce with sauerkraut. Best consumed after a day or two once all the flavours have had a chance to soak in. Cobanac is a meat stew that originates from the eastern Croatian region of Slavonija. As with most cooking from the Slavonijan region, paprika plays an important role. The slow-cooked stew can contain a mixture of meats including pork, beef, lamb, horse, game and pig’s feet. Traditionally it’s simmered for hours in a cauldron over a fire. Kotlovina is a meat speciality that is popular in Zagreb and northwest Croatia. Different types of meats are mixed with vegetables and fried in a big metal dish, before being slow-cooked with sauce. Kotlovina is traditionally prepared in a specially designed cauldron, and cooked outdoors. Oily fish is an essential part of the Dalmatian and Istrian diet. Sardines, mackerel, anchovy, Mediterranean sand smelt, tuna, and bonito are all grilled, fried or marinated. 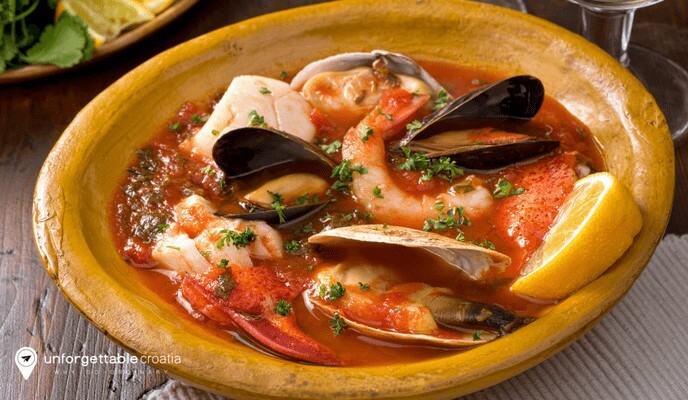 Brudet is fish stew that is popular in coastal areas of Croatia. Every family has its own unique way of making this dish. The fish is stewed with onions, tomato sauce, and spices, and is usually served with polenta. Greagada is another Dalmatian fish stew cooked with white wine, parsley, onions, garlic, capers, salted anchovies and potatoes. Buzara is a Croatian method of cooking seafood. Scampi, shrimps, mussels or clams are cooked with white wine, garlic, parsley and breadcrumbs. It is traditionally eaten with your hands. 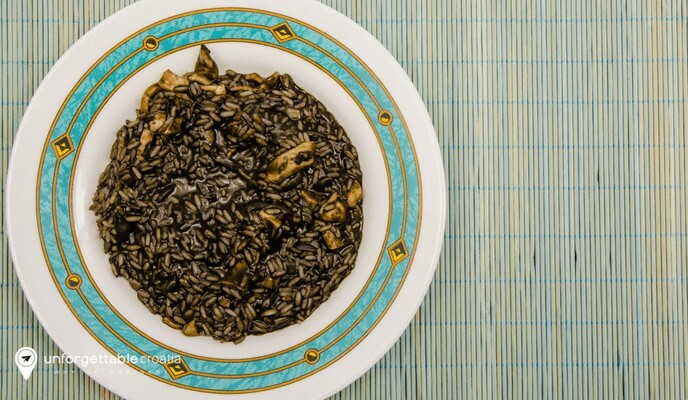 Crni rizot (black risotto) is featured on every seafood restaurant menu in Croatia. The squid risotto also contains mussels, clams and other shellfish. It’s delicious, rich and garlicky. To finish off your meal choose from Paprenjaci (cookies made from walnuts, hazelnuts, honey, butter and various spices), candied orange flavoured Arancini, Rozata custard pudding, traditional Krostuledeep fried pastries and Fritule (deep fried doughballs made with raisins, schnapps and lemon zest). 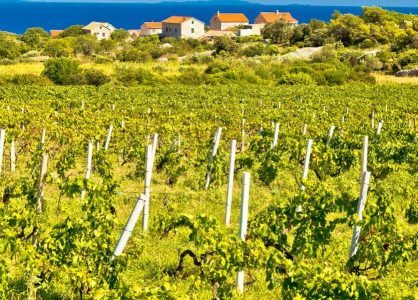 Sample a range of Croatian cuisines on a Croatia multi-centre holiday. Call our team on 020 8004 2345 to find out more.